Starwood Preferred Guest (SPG) has offered Gold & Platinum status challenges for the past few years (status matches previously but those have now ended) and for the first time launched last year a dedicated web page explaining the program. Now that SPG is part of Marriott it is a good time to take advantage of this challenge for the last time (if you haven’t previously). You can request the “Gold Challenge” or “Platinum Challenge” (never hurts to try registering for both) that require 9 or 18 paid nights during a 90-day window. These challenges don’t require you to have status with other hotel chains. Make sure that you sign up (they have previously allowed this) for both Gold and Platinum challenges at the same time to maximize the number of points that you earn and potential upgrades that you receive for reaching the Gold status first. You can choose January – March, February – April or March – May challenge periods at this time. For example, if you complete the challenge successfully after March 1, 2018, your status will be valid until February 28, 2020. Only paid nights count towards the 18 nights required. Awards or Cash + Points nights are ineligible. You can, however, get credit for up to 3 rooms at a time. SPG launched this dedicated Status Challenge website last year and it was supposed to expire on December 31, 2017, but seems that they decided to extend the offer through June 30th. This is also great way to get Marriott Rewards Gold or Platinum status. SPG Gold maps to Marriott Gold and Platinum to Platinum! You can access the page to link SPG and Marriott accounts for status transfer purposes here. Registration: Between January 1, 2018, and June 30, 2018 (by 11:59 p.m. Eastern Time), eligible SPG® members will have the opportunity to register for the SPG Gold or Platinum Status Challenge (the “Status Challenge”) by calling SPG Customer Service to register. Members must choose either the Gold Status Challenge or the Platinum Status Challenge. Offer: Members must register by June 30, 2018, and choose a consecutive three-month (3-month) earning period (the “Challenge Period”) from the options provided at time of registration. For example, if a member registers in February 2018, the Challenge Period options from which to choose are: January-March 2018, February-April 2018 or March-May 2018. Platinum Status Challenge participants must complete 18 Eligible Paid Nights at participating SPG hotels and resorts within their Challenge Period. Gold Status Challenge participants must have nine (9) Eligible Paid Nights within their Challenge Period. SPG Award Nights do not count as Eligible Paid Nights for the purpose of the Status Challenge. Only eligible paid nights consumed within the selected Status Challenge period will count toward the Status Challenge. Eligibility: Status Challenges are not available to members who have earned SPG elite-level status within the five years prior to the current year. 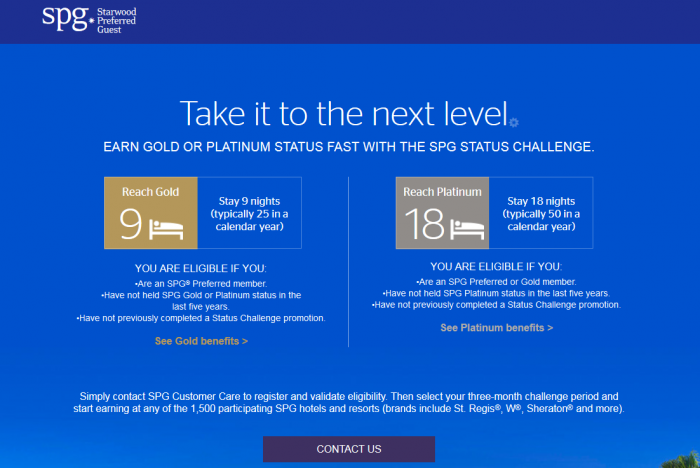 Specifically, SPG members who earned Gold or Platinum status in or after 2013 are not eligible for the Gold Status Challenge, and SPG members who earned Platinum in or after 2013 are not eligible for the Platinum Status Challenge. Members who have successfully completed any prior SPG status challenges may not register for this Status Challenge. Members may register and attempt to participate in the Status Challenge again if they fail to complete the Status Challenge. If a member completes the Gold Status Challenge and is successful, he or she is able to come back to register for the Platinum Status Challenge. Members may not, however, repeat a Status Challenge that they have already successfully completed. SPG members who reach SPG Gold or Platinum status by linking their SPG and Marriott Rewards® accounts will not be eligible for the Status Challenge offer. Earning: Members who meet all terms and conditions and successfully complete the Gold Status Challenge will be upgraded to Gold status. Upgrade to Gold status will occur within 5–7 days of the stay posting to the member’s account with the ninth (9th) Eligible Paid Night completed. Members who meet all terms and conditions and successfully complete the Platinum Status Challenge will be upgraded to Platinum status. Upgrade to Platinum status will occur within 5–7 days of the stay posting to the member’s account with the 18 Eligible Paid Night completed. Once an SPG member reaches elite membership status, the applicable benefits will commence during the member’s Status Challenge Period. The Elite Status Challenge entitles members to one full year of elite status, from one renewal period to the next. If a member is upgraded via the challenge on or before February 28th, 2018, they retain status until February 28, 2019, the following year. If they are upgraded on or after March 1, 2018, they retain status for the remainder of the year, all of 2019, up until February 28, 2020. Not responsible for omissions or typographical errors. Marriott International, Inc. and its affiliates reserve the right to modify, change or terminate any of the terms and conditions of the Status Challenge in its entirety at any time, without notice. An Eligible Paid Night is a night at any of the more than 1,500 participating SPG hotels and resorts paying an Eligible Rate during the Status Challenge Period. Nights do not have to be consecutive and can be accumulated across multiple stays. An Eligible Rate is any rate that is eligible to earn Starpoints® in the Starwood Preferred Guest® program. SPG hotels and a description of Eligible Stays and Eligible Rates can be found at spg.com under Terms & Conditions of the SPG Program. Eligible Paid Nights do not include those nights reserved through a third-party online agency, such as Expedia, Priceline, Hotwire, etc. Please see Terms & Conditions of the SPG Program for more information on what qualifies as an Eligible Night. Void where prohibited.